We had an extra-busy week last week, as we prepared for the Saturday Movie Premier and dinner party here at the Center. The weather was beautiful all week long, resulting in many outside activities - games of capture-the-flag and four square happened almost daily, with one such four square game involving roving players on rip sticks and roller blades, to add to the excitement! Walks were taken in the beautiful Spring-green woods which surround our building, while some inside games happened too. Settlers and Bananagrams are among the favorites, along with ping pong, plain and musical! We had a delicious spaghetti feast on Wednesday, making a lovely meat sauce from scratch. Nicole Gareau came by after lunch to show interested kids how to make fabulous fabric flower clips for their hair. Then on Thursday, Mihoko, from Saori Worcester Studios brought two of her looms to the Center, and the kids learned how to weave Saori-style - unique woven pieces were produced, one of which was long enough to grace our buffet table on Saturday evening. 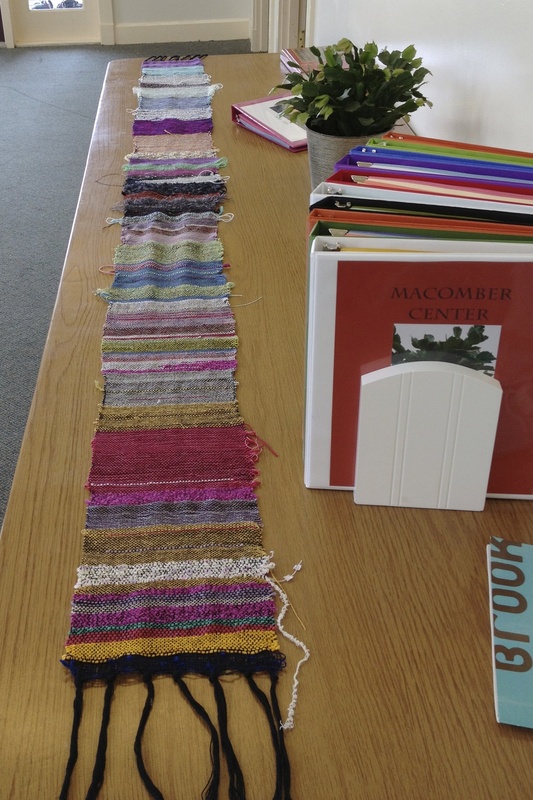 Many kids had a hand in making this colorful runner, and it certainly added a note of beauty to the table! Saturday evening was our big night - two movies, made by Mark and the kids, were shown here at the Center, after a wonderful meal of quiche, plentiful salad, and ice-cold lemonade made from fresh lemons squeezed by Nell! She worked hard! As the sky darkened after everyone had eaten their fill, the tables were cleared and put away, the move screen was pulled down into place, and the room was transformed into a theater. The two movies that followed were the perfect end to a lovely evening, and were enjoyed by everyone! What a talented bunch of actors appeared on screen - huge thank you's to all of them, and to Mark, for creating such excellent entertainment!